The OXO Good Grips Containers seems to be well received. They currently have a 4.4 star review, as well as the badge for Amazon's Choice. However, there have been come complaints with the product that are worth mentioning. So let's find out if this is really worth your money. The OXO Good Grips Containers are made completely from plastic and silicone. While plastic is not as high quality as glass or metal, it is still durable and lightweight, which makes it perfect for carrying on the go. However, most of these containers are designed for use in your home, which also works as well. At least there will not be much extra weight from the container itself, as there is with glass. The care level for the OXO Good Grips Containers is a bit different than others. They recommend handwashing the container itself, while the silicon lid is dishwasher safe. However, I would still recommend handwashing the entire product, as there is less of a chance any of the parts will get damaged that way. That being said, even though it is made of plastic, there are no odd folds or curves to these containers. It is all very quick and easy to clean. In terms of build design, these are very space savvy. While the design does inhibit you from stacking these on top of eachother, they can be placed side by side without taking up a whole lot of room. They are build with a modular design, which gives them more vertical space or allowing them to be tall, rather than wide. These containers have a bunch of cool features. One very unique feature is the lid design for the OXO Good Grips Containers. It gives you a button that you can press, or POP, to give the lids an airtight seal. When you want to open them back up, simply press the button again and lift the lid off. Meaning that your food will stay fresher, much longer. Plus they are able to be frozen, which extends the freshness time even more. Because the lids are plastic, they are able to securely and tightly fit, creating a very snug and secure seal. There are a lot of different sizes for these containers. Each "designed" to hold a different type of food. I put designed in quotes because while they are labeled as such on the product page, you can put whatever you really want to in these containers. But the quart sizes of these containers ranges from 0.5 qts, all the way to 5.5 qts, and everything in between. So you can buy them individually or as a pack, which makes it very convenient. OXO was founded on the philosophy of Universal Design. This means that the design of the products is usable by as many people as possible. 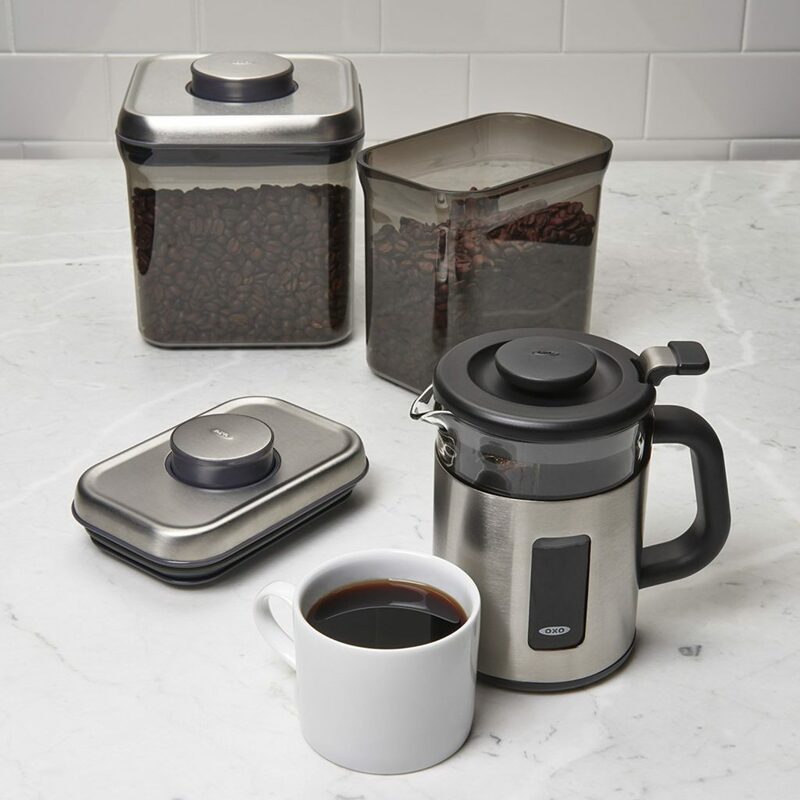 Today, OXO offers 1,000+ products covering many areas of the home, all created on this principle. They supply products for many different areas of your home. These include cooking and baking, coffee and tea, beverage, storage and organization, cleaning and laundry, gardening, and even baby/toddler products as well. Their POP containers, like the one we are reviewing here, are available in many different sizes, to meet whatever your needs may be. The OXO Good Grips Containers are made totally from BPA free plastic. This build makes them lightweight, but still very durable. They are also easy to clean, though they do recommend handwashing them as much as possible. These containers are very space savvy. Due to the variations in size, they can easily be placed side by side in the fridge or cupboard, depending on the contents. The smaller sizes can also be stacked on the larger ones as well. The POP lids offer great saving of any leftovers that you may want to save for later. They offer an airtight seal, which seals in flavor, aroma, and freshness for an extended period of time. Plus they are BPA free as well. Some of the most common complaints from customers were actually around the one thing that makes these containers unique. Their POP lids. Many have said that the suction has decreased since they had bought them. Some even saying that there is no airtight seal anymore at all. This may have to do with a malfunction in the POP design, or from dishwashing them and the seal becoming damaged from the heat. The fact that the most common critical review complaint for this product is that the seal died is very concerning. I mean, these are literally called OXO Good Grips POP Containers. So what happens when their POP lids fail. Kind of undermines the entire product, not to mention the company. However, only 9% of the total reviews were between 1 and 2 stars, with 86% of them being between 4 and 5, so do with that what you will. The issues could very well just be outliers, who knows. Overall, the OXO Good Grips Containers seem pretty well made. The POP lid design is definitely unique, only question is if it will continue to work perfectly. If you want to try these out for yourself, you can find individual containers for sale on Amazon for $8.99. For more information, including the best food storage containers, check out the rest of Green and Growing. Here are some top questions that I found for people seriously considering buying the OXO Good Grips Containers. Is the seal as good as the clamping design? Yes, the POP works very well and is easy to use.